Beautiful, classic David Tutera for Mon Cheri wedding dress in excellent, worn only once and altered. Style name and number: Kalia – 110218 Description from the website as follows: Sleeveless soft lace and taffeta modified mermaid gown with hand-beaded and re-embroidered lace appliqués, tip-of-the shoulder illusion and beaded lace straps, scoop neckline and back bodice, hand-beaded and embroidered lace bodice accented with Swarovski crystals, pleated taffeta midriff accented with jewelled motif at centre, covered buttons trail down back bodice, chapel length train with matching beaded lace appliqués and pleated gore inset. 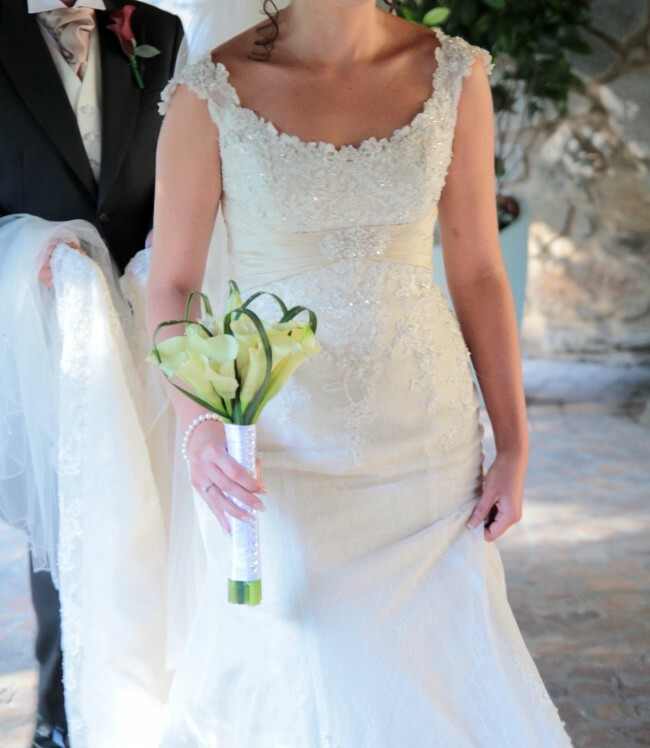 included, is a beautiful custom made cathedral length veil made to match with Swarovski crystal beading on the edge. Altered slightly to fit perfectly.